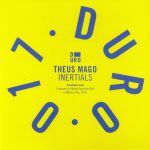 Review: As well as manning his own label Duro, Theus Mago can be found slinging out heat on Turbo, Kill The DJ and more recently Ombra. The Mexican producer returns to home turf for his latest transmission, serving up one original track with two killer remixes. "Inertials" is a rowdy beast in its original form, tapping up a breakbeat roll, dirty wave synth stabs and plenty more sonic debris for a cut that spans a whole lot of styles and makes them gel together seamlessly. Inigo Vontier takes the original and makes it into a bone-rattling drum track to batter the crowd into submission very late on in the dance. Jamie Paton takes a different approach on the B-side, weaving a little tenderness into the mix with some elegant synth lines that offset the raw bite of the drums beautifully.